"With a cell phone or an Internet connection, now you can find out when your bus is coming -- at any of Metro's 12,000 bus stops," said Metro Board Member Christopher Zimmerman of Arlington. With the phone service, you can call (202) 637-7000 and enter the ID number of your stop, as shown by the sign located at each stop. In the online version, you choose a bus line in the WMATA system, which stop you're interested in, and which way you're going, and the service will tell you roughly when the next bus or couple of buses will be at that stop. Assume there could be a bit of variation between the NextBus time and the actual arrival time as you never know what could happen (red/green lights, construction, etc) that might slow the bus down a couple of minutes or cause it to get there a couple of minutes early. Click here to see an example (10A bus at Mt. Vernon and Reed Ave headed northbound). You can also bookmark your stops and view the whole bus line on a map. In map view, you can click on any stop on a line and it will tell you when the next bus will be there and will actually show you where the buses are and which way they're going right now. If you're not sure which bus you need to get where you're going, you can enter your departure and destination into WMATA's trip planner or look at the bus maps online. NextBus should make it much easier and less frustrating to take the bus since you will know when to expect it and you waste less time standing by the curb. Site investigations found reportable concentrations of lead, petroleum hydrocarbons and chlorinated solvents in the groundwater and reportable levels of arsenic in the soil. A total of 55 tons of impacted soil was excavated and disposed of off-site. Air testing at [the old Duron Paint building] confirmed no adverse impacts to indoor air quality. A groundwater deed restriction will be placed on the properties to prohibit use of groundwater. No other restrictions are placed on the site, and groundwater was never planned to be used. The whole report is located here. The important thing is the properties can be used for just about anything park-related. The 3 demolished properties can be converted to parkland and the remaining building could be used for a number of purposes (administrative office, satellite police station, community facility, etc.). 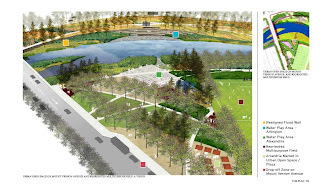 Here is a past post on park expansion. The planning process will kick-off on July 7th at the site of the demolished properties. An official release on the meeting has yet to be made, but we will post an announcement when a time is provided and the location is confirmed. At the June 9 City Council meeting, Council approved a set of "priorities, staffing levels and funding for the Department of Planning and Zoning" for Fiscal Year 2010 (link to PDF). Not surprisingly, actions currently underway were at the top of the list, including the completion of Potomac Yard and Waterfront plans and beginning the implementation of Landmark/Van Dorn plans. At #4 on the priority list is the completion of the city's Wayfinding design guidelines that have been a lengthy work in process, eating up P&Z resources for quite some time. However, at #5, for the first time since the city wrapped up Arlandria's small area plan in 2003, we're back on the priority list and at a position where it is unlikely to get pushed aside. However, the language is fairly non-committal: "Prioritize support for implementation of the Arlandria Action Plan". Does that mean we are a priority to get prioritized? I'm hoping this is not a brush off, but a commitment to actually implement major pieces of the Arlandria Action Plan and re-look the rest. My journey of increased civic participation began with nagging City Council back in January to update the moribund Arlandria Implementation Schedule so I could figure out the status of various actions. As it turns out, that, along with a few follow-up e-mails, was enough to get the attention of council members Justin Wilson and Rob Krupicka. They dug in and told P&Z to get Arlandria back on the schedule, resources be damned. P&Z staff was not able to dust off the implementation schedule that had not been touched in 2-plus years, but they at least got it on the schedule for this coming fall. We'll see where this leads. NOTICE: RSS feed for The Arlandrian has been updated. If you subscribe to The Arlandrian via RSS feed, you need to re-subscribe since the settings have been updated. The Mayor's Institute on City Design (MICD) will present expert panel findings on the design challenges of and recommendations for redevelopment of Potomac Yard's Landbay F. Landbay F is shown on the diagram at right and is where the Potomac Yards shopping center is currently located. A program sponsored jointly by the National Endowment for the Arts, the United Nations Conference of Mayors and the American Architectural Foundation. The MICD Alumni Technical Assistance program provides mayors, their staffs, and local stakeholders the opportunity to engage a panel of experts in an analysis of a proposed development, design challenge, or current urban development issue. It goes on to say that experts will present their findings from 5-6 PM at the City Council Workroom at City Hall on June 30th. Here's the link to the full PDF flyer describing the event. It includes biographies of panel members and some more details. You must RSVP to attend. UDR, the owner of the Calvert on Mt Vernon Avenue have begun talking about conceptual plans that promise to bring about a major renovation of the aging building. Still described by project representatives as an evolving concept, a recent preview shows that UDR plans to reface the existing tower and replace the front parking lot and retaining wall with a mid-rise (4 story),street-fronting apartment building. The new construction would incorporate the existing ground-floor retail but move it adjacent to Mt Vernon Avenue. 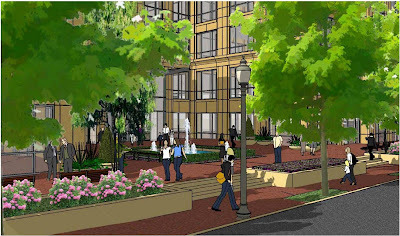 Some of the retail space would likely surround a central art or water feature in an open air plaza at the intersection of the T-shaped building as shown in the first graphic in this post. Most of the parking would be placed underground with some above-ground parking on the north side of the property, just as it is now. 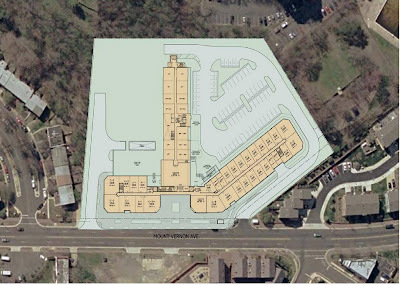 The current south parking lot would be replaced with green space adjoining Warwick Village and Goat Hill Park. The concept is by no means a done deal, but it looks extremely promising. 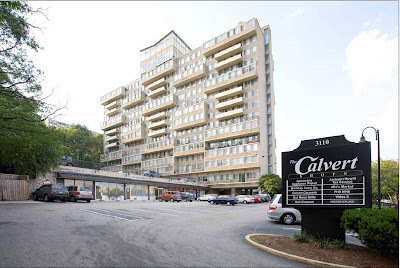 The renovations...which might take years...would revitalize an aging building, strengthen existing retail, and suggests that the Calvert could evolve along Complete Street principles. "Arlington's Smart Growth Journey" is a new documentary film that traces the dramatic history of the past half-century of growth and development in our community. How did Arlington get 11 Metro stops? What risks did leaders and residents take to balance neighborhoods and development? This tale of political wheeling and dealing, visionary planning, missteps and challenges is a glimpse into the recent history of Arlington, as told by many who were there. The full story makes for interesting viewing, but...thanks to our friends at Greater, Greater Washington, a 5-minute snippet of my favorite part is available for viewing (click on the movie at the top). This portion deals with bringing revitalization...without Metro...to neighborhing Nauck while preserving affordable housing: the goal of the Arlandria plan. "Customers at select CVS/pharmacy and Giant Food stores now can add value to their SmarTrip® cards at the same time they check items off their shopping lists. Metro and local retailers have made it more convenient for busy riders to add value to their SmarTrip® cards by installing the small, portable devices to process SmarTrip® transactions at more than 100 local retail outlets." 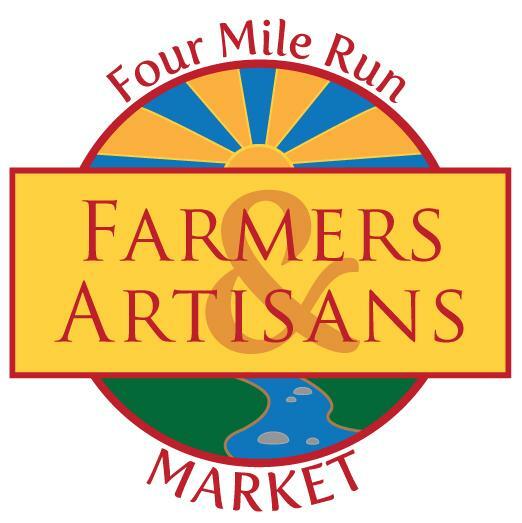 The list of locations is online here. In the neighborhood it includes the CVS at 3811 Mt Vernon Avenue and Eagle Financial at 3500 Mt Vernon Avenue. "I even saw a sign the other day that said 'Anderson Bikeway' along 4-Mile Run, whatever that is. " says Steve Offutt of Greater, Greater Washington (Trail signs should work like street signs). I agree it's pretty confusing and our area trails are mostly a patchwork of short run some of which may not even connect. But I know the Anderson Trail pretty well. Above is a map...a pretty old map...that I found on the website of the Friends of the WO&D Trail. The map is pretty out of date (doesn't seem to show the Four Mile Run trail that runs along South Glebe Road, north of the stream). And it suggests that there might be a trail south of the Run in Alexandria between Mt Vernon Avenue and West Glebe Road (one day maybe says the Four Mile Run Restoration project). But it does get something right. The Anderson Trail...or perhaps, Anderson Bikeway....is the proper name of the trail in Four Mile Run park between Route 1 and the Avenue. Here's a view of the trail at an entry point at the end of Commonwealth Avenue (where someday there might be a bridge to Eads Street in Arlington). Note the monument to the Army Corps of Engineer flood control projects. 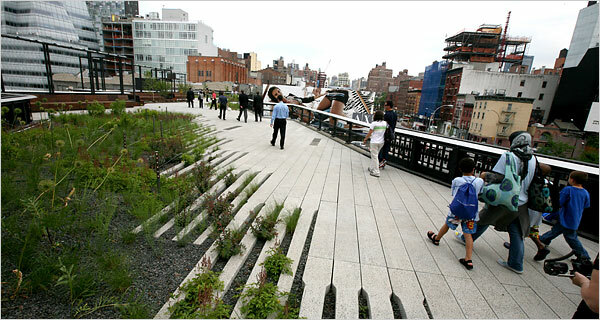 The first time that I heard about the High Line in New York City it was still merely a concept that existed only in pictures, much like the conceptualization at right from the Four Mile Run restoration master plan. 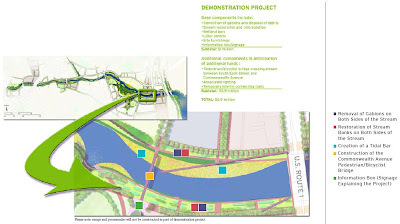 The Four Mile Run plan envisions restoration of the stream for a variety of active and passive use from Shirlington and Nauck down to the Potomac River. 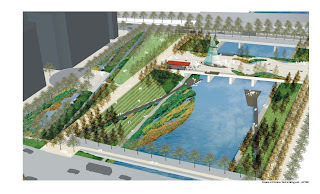 While much of the plan focuses on naturalizing a flood control project (also known as a 'drainage ditch'), other parts of the plan envision reusing unused, former industrial structures for recreation. The old railroad bridge in Potomac Yard pictured above is one such example. For now the Four Mile Run restoration exists mostly in concept, but elements are coming closer to fruition. Funding is becoming available for a demonstration project between Mt Vernon Avenue and Route 1 and planning on the Four Mile Run Park expansion is due to begin soon. But the news about the High Line is a reminder of what a group of people can accomplish and that hard work can bring concepts into reality. "Arlington, like communities around the country, once had a network of streetcars. Today such transit lines are making a comeback in many jurisdictions. Locally, similar projects are also being planned, including a streetcar line in Anacostia and a possible line between Crystal City and Potomac Yard" (emphasis added). "(Arlington County and Metro board member Chris) Zimmerman hopes the (Columbia Pike) line can be the first piece of a network of surface rail that would include a link to Potomac Yard and Crystal City." See the Pike Transit Initiative for more. With Shirlington becoming a new transit hub with the recent opening of the new, state-of-the-art station, it's welcome news that a couple of new routes have begun operating from there to other 'urban villages' throughout Arlington. The Shirlington transit hub is within walking distance of much of Arlandria. Alternatively, locals can transfer to these new routes via the 10B and 23A Metrobuses....and maybe, oneday, DASH?